For some years now, during the Fridays in Lent, I have been only consuming what I’ve grown myself in my garden. You can read about my previous Homegrown Fridays here. I know from experience that this takes some concentration and dedication each Friday that I do this. We usually have something at a meal that comes from our garden or from a farmer we know personally, but limiting the meal to only what I’ve grown means no dairy products, no vinegar on the greens, and no olive oil. Also, this time of year if I’ve run out of potatoes and onions I have to buy them from the grocery store—something I’m not happy with. Last year, in spite of being terrifically busy writing Grow a Sustainable Diet, I kept to the Homegrown Fridays eating only what I had grown. This year I am deep into writing another book—Seed Libraries and other means of keeping seeds in the hands of the people. I really want to keep the momentum going on this newest book and decided to be kinder to myself and not be so distracted on Friday. Also, maybe if I back off a little on my self-imposed rules, others will find it more doable. Last year on my Homegrown Fridays 2013 post I invited comments from anyone who had tried the same thing and had no takers. I’m still sticking to eating something that I’ve grown at each meal on the Fridays in Lent, unless I’m traveling and eating away from home. This year, however, the meals might also include some other ingredients. The stored staple crops I have available are the same as before—sweet potatoes, cowpeas, corn for cornmeal, garlic, peanuts, and maybe hazelnuts and walnuts. There are also greens from the garden, eggs from the chickens, dried and canned produce, and mead. Check my past Homegrown Fridays for examples of meals from only these ingredients. This year I have some new additions. We made grape juice from our grapes in 2013. Not a lot, but some to save for Homegrown Friday breakfasts. Breakfast is still by the old rules. I have cornmeal mush cooked in water, rather than milk. The honey I put on it is a gift from my friend Angela’s bees (okay, so I bent the old rules a bit for breakfast since it’s not my honey). Our bees did not survive the winter in 2013 and, being so busy, we didn’t replace them. However, new bees are arriving this week. Yeah! I tried a new corn in 2013 and find I like the taste a little better than Bloody Butcher. Floriani Red Flint corn didn’t yield as well as my tried-and-true Bloody Butcher that I’ve been growing for more than twenty years, so I’ll be working with it to see what I can do. I’ll be planting both varieties in 2014. When I first planted Bloody Butcher I had also planted a yellow variety that I don’t remember the name of. Bloody Butcher did much better than the yellow corn, so that’s what I stuck with. 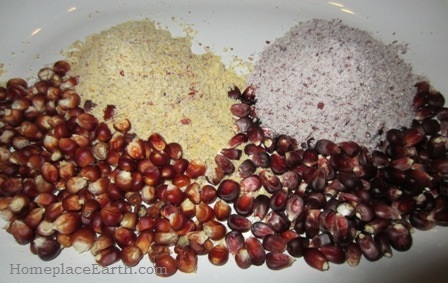 Since Floriani Red Flint and Bloody Butcher are both red corns, I was surprised at the difference in color when I ground them into cornmeal. You can see in the photo that Floriani Red Flint is yellow and the Bloody Butcher cornmeal is purple, which I was already familiar with. Changing the rules gives me the opportunity to tell you about my dried tomatoes in olive oil. When I dry tomatoes in my solar dryers, sometimes there are ones that aren’t quite dry when the rest are. I put the not-quite-dry ones in a jar of olive oil that I keep in the refrigerator, adding tomatoes as I get them. An easy and tasty dish is to sauté a cut-up onion in the olive oil from that jar, along with some of the tomatoes. 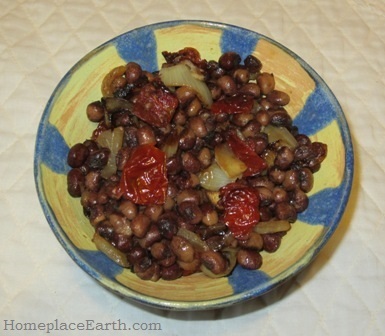 Add some cooked cowpeas until they’re heated through and there’s lunch. I often refer to those tomatoes as flavor bites and add them to scrambled eggs and quiche. 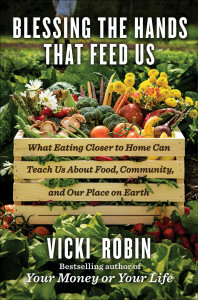 If you’ve enjoyed following my Homegrown Fridays, you are going to love reading Blessing the Hands that Feed Us by Vicki Robin. If her name sounds familiar, you may know her as co-author of Your Money or Your Life. I read Blessing the Hands that Feed Us when it came out in January this year and thoroughly enjoyed it. Robin limited her diet to what was grown within 10 miles of her home for a month! It all began when a friend wanted to find someone to feed from her garden for a month and Robin, who refers to sustainability as an extreme sport, offered to give it a try. Before starting on this adventure she put some thought into it and decided to widen her diet to the ten miles to include dairy, eggs, and meat, but the bulk of her meals came from her friend’s garden. She allowed what she referred to as exotics—oil, lemons and limes, salt, a few Indian spices, and caffeine–which enhanced her meals. Giving yourself limits like this doesn’t so much limit you as it does open your heart and mind to so many more issues at hand. If you include exotics, how are the workers responsible for growing them and bringing them to you being treated? How is the soil that grows these things being treated? The food you get from local growers—how is it grown and are the growers getting a fair return for their labor, knowledge, and care? Is the treatment of the soil your food is grown in building the ecosystem for those living nearby and for the earth community at large? One of the things that Robin brought up in her book was that as we go forth in these changing times we need to be operating out of love and not fear. I talked about that same thing in Grow a Sustainable Diet. Both books also talk about community. We do not live in a vacuum, needing to provide all of our own needs. Yes, on Homegrown Fridays I explore what it would be like if my diet only consisted of what I’d grown myself. I do that to bring my own focus to what is really important to me and examine what I really need. It deepens my appreciation for what I eat all the other days of the year and for the people and the land that supply what I can’t. When Angela gave me that quart of honey last summer, I truly valued it, knowing that my homegrown supply from the previous year would be running out. My Lenten Homegrown Fridays begin the thought process about what it would take to go forth in a peaceful, loving way that treasures all of life.